... courtesy of PCM5102A, which is an i2s stereo audio DAC. 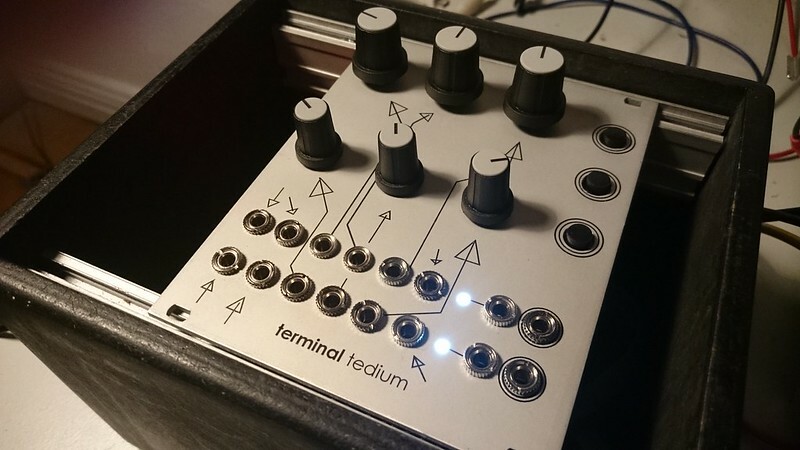 the point was/is to get decent sound quality at modular synth levels, rather than having to use an usb audio interface or the native pwm output. at any rate, this isn't supposed to show off some pd patch. .. sorry i didn't come up with something more decent (or at least systematic); truth is, i didn't get round to spending a great deal of time on/with the software side of things, so it's just some fairly straightforward pitch shifting and time-stretching, where pitch and stretch factor are controlled by control voltages (some random-ish sample+hold stuff; not that it's noticeable). PT2399 based delay, with the feedback cranked up. the outputs go into a L-1 stereo mixer (one via the delay) then straight into my audio interface. everything is stereo, 16bit 44.1khz (pd) or 48khz (aplay). well, some of the wav files were actually converted from mp3. Always a silly thing to say in the DIY section, but... I'd love to read this module could be built for someone (me hint) or at least a project kit with instructions could hit the market. I have a Phonogene and this would compliment it well. Good job and nice panel graphic. Wow! Super interesting! Is there a thread that goes into detail of this project? My search has left me with nothing. as to DIY, well, it's meant to be diy. and cheap, too. it's SMD though, necessarily so, those audio DACs tend to come in SMD only (20 TSSOP in this case). but that's the only somewhat tricky part to solder. i did it, and i'm not particularly good at soldering. in theory, you can get pre-populated rpi DAC boards for just under 30 euro; it wouldn't be a big deal to adapt the module so that it could alternatively interface with that DAC board (hifiberry). it'll still be SMD, but with less tiny parts? Very cool, I just bought a raspi to play with for my modular as well, so it's great to see someone doing the same thing. Can't wait for the gerbers to be posted! I haven't done smd yet on my cnc mill but its worth a shot. I'm loving all these mini-computers inside modular panels! Please let me know if you offer up a DIY kit. Or at least the processes to do it on our own. sure, but definitely no kits. even if i had the time to do it, i'd be surprised if i sold 10, so there's no point in buying things in bulk either. it's all commonly available parts, anyways. i will/can, as mentioned, simply post the gerbers. it's just that i want to make sure everything is ok with the revised board before letting it out into the open. won't get near a soldering iron any time soon though. build one up now and everything seems to be working out nicely this time round ... slightly improved layout, too. except the two tact switches, which i couldn't fit anywhere else. bottom side w/ mounting screw. probably should get one of those smallish microSD adapters though. anyone who got one of the first run of proto boards and hasn't built it yet, let me know, i have a couple of spare boards left. i'd be interested to build this too, i like the sound. that was my thinking, i never really used mine. and sure, i can send you one - doucheland is where i am? as to the sound, i actually haven't compared things with the native pwm output. i *think* the DAC sounds much nicer (well, it better should have) but that might just be psychological. anyways, i didn't mean to show off the pd patch, that was just put together really quick. if its possible to program it without a Raspberry I would like one. yes BRD, and that would be great! you could of course attach any other microcontroller or SoC that comes with SPI and I2S, but in that case i think i'd just use a pcb customised for that specific micro/purpose. at any rate, without a raspberry or similar, it's not going to do much. (that said, not having to program a great deal (as in DSP) is part of the appeal, it's more about using programs (such as pd or csound)). Just wondering, could this be built with banana jacks, or is there a reason (electronically) that it would need mini-jacks? Also, is the supply voltage critical? (i.e. 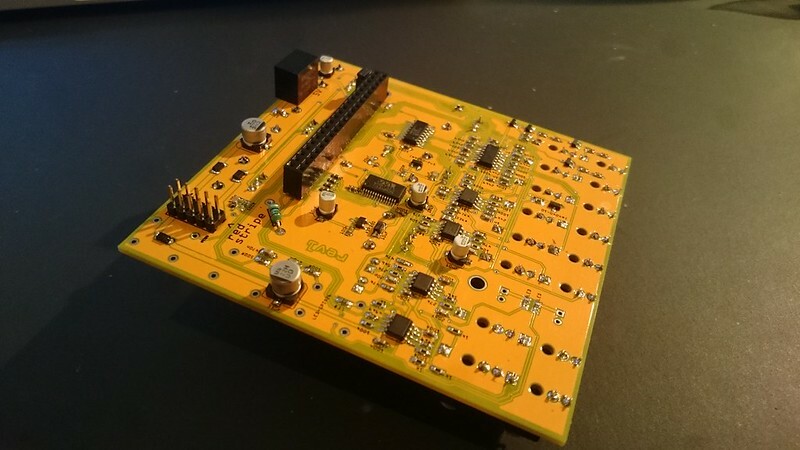 could it run on +/-15v without modifications)? im a little confused. what i really want to know is can i upload PD data from osx? or its only for RPI? This is basically a breakout board so that one can get signal i/o for using a Raspberry Pi in/as a synth module. PD needs some computer to run on, and this case that is the Raspberry Pi. So you could load patches from another box to the SD card or whatever, and run them in PD on the Pi. I hope I am being clear. oh, alright, sorry i didn't get it the first time. well yeah, as CJ MILLER said, once the rpi is set up you can pretty much ignore it. i do all the pd stuff on my notebook then just copy it over to the raspberry. there's tons of info on the web re running a pi "headless". mmh, i haven't ever used banana jacks, so i can't really tell. i would have guessed you'd be okay except i don't know how banana people prevent inputs from floating. when using 3.5mm jacks the inputs to the ADC are tied to ground when nothing is plugged,... i imagine there must be some way to achieve the equivalent effect with bananas? re 15v: it won't make a difference in theory, in practice i imagine the 7805 might get rather hot, ie when powering the thing entirely from your 15v psu. what i've been doing so far is to power the rpi separately (via micro usb/wall wart), so it's really only the op amps that need +/- 12v. so that will work. i still have to try, but there's jumpers on the board that will allow you to either power the entire thing from the rails or else, attach a suitable 9v wall wart to power the rpi (the 7805), which i figured will make it easier to put everything in a rack as you'd be able to use regular power jacks rather than some usb feed-through contraption. 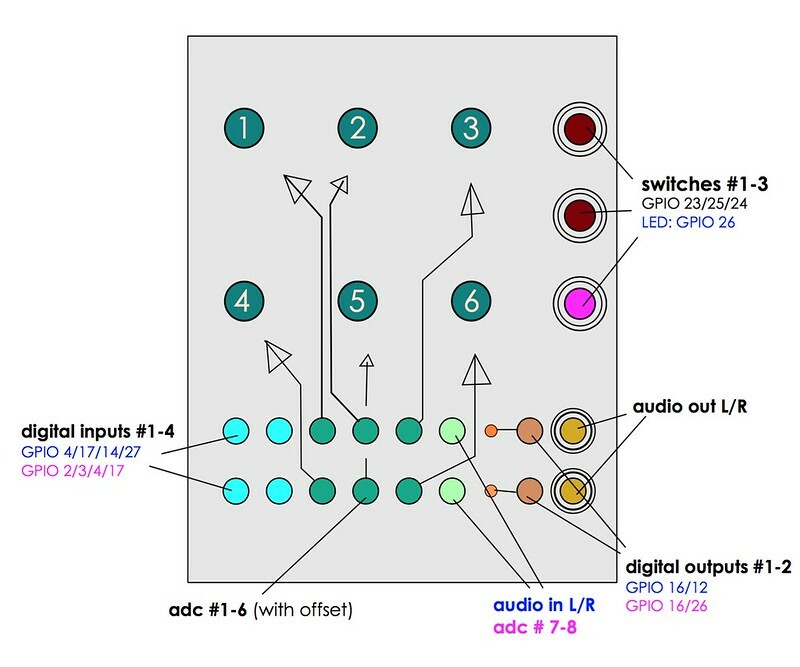 Would it be difficult to do something similar but ditching the audio side of things while adding dc-coupled CV and trigger outs? I'm more interested in using the raspi as a sequencing/triggering/modulation device with input from the modular side.